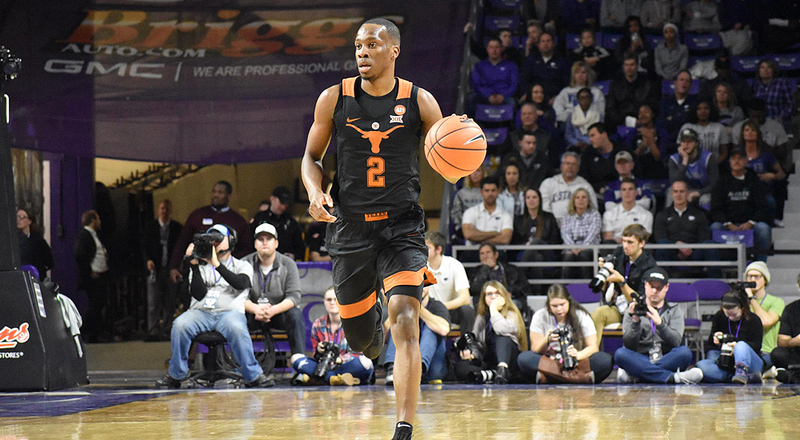 Guard Matt Coleman scored a team-high 16 points, but the Texas men's basketball team's second-half rally fell just short in an 80-78 loss at Kansas (photo courtesy of texassports.com). LAWRENCE, Kan. — Guard Matt Campbell scored 16 points to lead five Texas Longhorns who scored in double figures, but an attempted three-pointer by Jase Febres clanged off the rim and glass in the final seconds, allowing Kansas to knock off Texas, 80-78. Febres had drained a couple of three-pointers late in the second half to help Texas rally from a 10-point deficit in the second half to take a late lead before losing their 10th straight game to the Jayhawks. The loss dropped the Longhorns’ record to 10-7 overall, and 2-3 against Big 12 teams, while Kansas improved to 15-2 and 4-1 in Big 12 games. In addition to Coleman’s output, Texas got 13 points from guard Kerwin Roach, 12 from Febres, 11 from forward Dylan Osetkowski (who came up one rebound shy of a double-double) and 10 from guard Courtney Ramey. Coleman has been more than a scorer for the Longhorns: through five games against Big 12 opponents, Coleman has an unbelievable 27-3 assists-to-turnovers ratio. The Longhorns, who led, 40-38, at halftime, came out on the short end of two statistics that often are the most important in many games: KU outrebounded Texas, 38-31, and the Jayhawks connected on 53.7 percent of the shots from the floor, compared to 42 percent by the Longhorns. The game stayed close in part because the Jayhawks connected on just 11 of 21 free throws. Kansas trailed at the intermission despite not committing a single turnover in the game’s first 20 minutes, and coughing up just four in the entire game. LaGerald Vick led Kansas with 21 points, followed by Marcus Garrett, a defensive specialist who had a career-high 20. Dedric Lawson chipped in with 17, and Devon Dotson added 10.